Wondering if you should be outsourcing? And if so, to whom? Here’s how to find out! You may just realize you’re ready to meet your brand new marketing team. Hi, nice to meet you! We’re your new marketing department. No need to hire your own internal team, worry about training, or shell out for benefits. We’ve taken care of all of that. So let us get started connecting you with your customers and growing your business’s sales. *Sigh* – wouldn’t it be great if it was that easy? Over the last 15 years, we've spent a great deal of time talking to business owners, marketers and executives about their various needs and marketing goals. 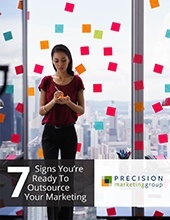 And from those conversations, we've written 7 Signs You're Ready to Outsource Your Marketing – our guide to outsourcing best practices and what it takes to decide if investing in outsourced marketing services is the right choice for your business. Think you could be ready to take that next step? Simply fill out the form to get our free guide now!